At CICS, we feel that the best way to meet the needs of those we work with is to work with them personally. Please reach out to us to allow us to discuss your industrial / environmental cleaning and maintenance needs. 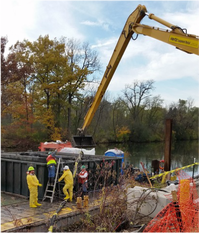 Some of our popular services are: Landfill maintenance, especially pits, leachate systems and cleanouts / manufacturing plant / facility cleaning / culvert or drainage cleaning / jetting & video. Also feel free to look at some examples of work on our photo gallery.